I love art, skateboarding, and fashion – so obviously I love everything about this photo from angelica_marchiori. To me skateboarding should be fun and fashionable. A lot of times in my community it becomes all about the trick. “What did you land?” That’s just one small part of skateboarding the bigger part is the freedom to just skate. Love this look and vibe – perfect score! This picture is from the Dorset Skateboarding Meet in the UK. 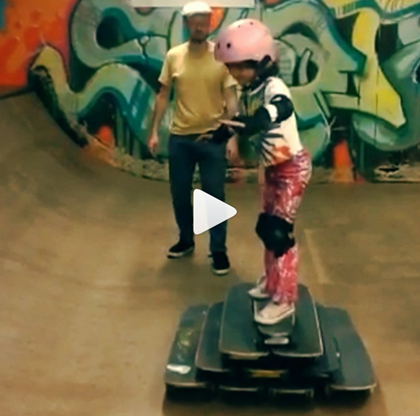 They call this is a seedling session – how cute is that a seedling session because one day the little skater will bloom into a stylish shredder. And boys yes, you in the background on your scooters – I see you – what are you thinking? That’s right we create the change we want to see. 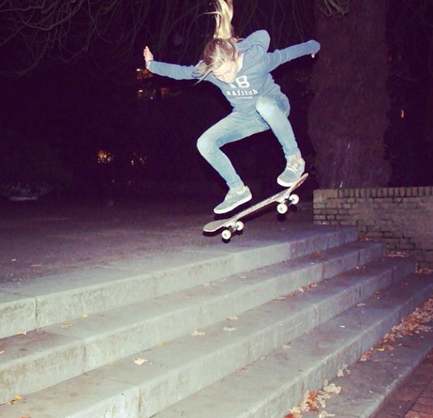 If you want to see more girls skateboarding support the girls already skateboarding and help other girls to learn. Getting more girls to skateboard is like a garden lots of work and fertilizer but keep caring for it and it will bloom. I consider skateboarding sport & art. I’ve also likened it to rolling yoga. Good to know I’m not alone – in Brooklyn there’s Skate Yogi. Check out Skate Yogi at their site and on IG. After a recent shredding party there was time for a ten board pyramid! 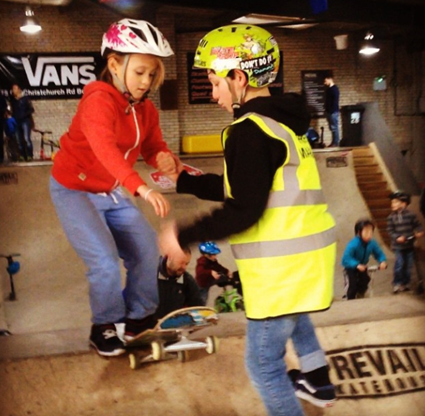 Exactly what skateboarding should be – all about the fun! And of course I’m digging the pink fashion! Recently I got a comment regarding my support of other sites. I’m on a mission to get girls skateboarding – I want to show the world skateboarding can be fun & fashionable as well as what you see on TV. I also want girls to know they have supporters. The media shows a snapshot of skateboarding this blog is about showing a bigger picture. I 100% want to let others know about people and organizations who believe GIRLS CAN SKATE! 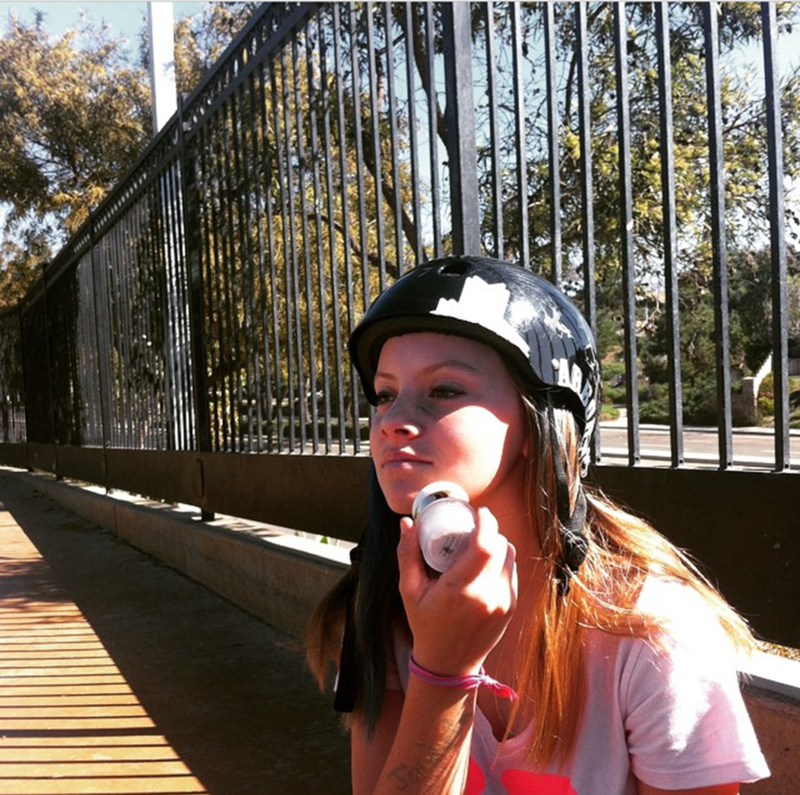 This is Camille currently she’s the only girl in her village who skates. Camille is proving if you want to skate, you’ll do it. Skateboarding might not be for everyone but it’s definitely for those who want it. While there are incredible places to skate indoors especially in Europe, a lot of skateboarding is under the sun. So, besides the board and fashion bring the sun screen. I have fallen in love with Jane Iredale Powder-Me SPF Dry Sunscreen it’s super easy to apply and doesn’t leave a weird oily feeling. And don’t be like – it’s cloudy I don’t need sun screen – put it on! No worries on it running –action sports are no problem for Jane Iredale products. Hope you check Jane Iredale out as they’re one of my top 10 favorites. Actual shots of me skating with it on are on skatingfashionista IG. I wouldn’t be skateboarding without my dad & mom’s encouragement. I love to see other girls get encouragement. 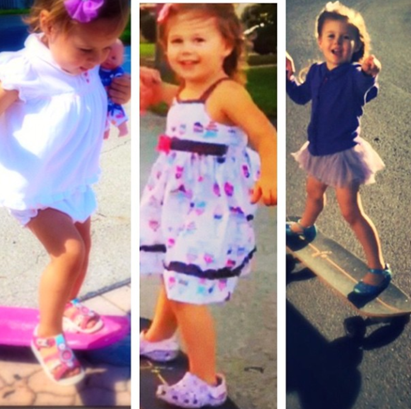 Good job Glitteryaj showing your daughter skateboarding is fun & fashionable! Trust me if you don’t fear the board, you skate a lot better and learn faster. Yesterday I went to the first Exposure Skate Ride & Dine. It was at the new park in Cardiff CA and Leaucadia Pizza in Encinitas. Exposure Skate is dedicated to empowering women. I am so thankful for groups and companies like them – Hoopla, Skate Like a Girl, Girls Skate Network, and Girls Not a Four Letter Word are just a few examples of organizations that offer encouragement to girls to start and keep skateboarding. I had the pleasure of visiting Hurly Headquarters in Costa Mesa, CA and chatting with Dominique Astorino their PR & Communications expert. I’m not sharing pictures from the tour because it was after all at their top secret compound. Literally they have a village of buildings, which look incredibly similar from the outside but once inside – WOW. Hurley is known for its contribution to surfing. Reading about their technology like Phantom board shorts that are faster, lighter, and flexible is one thing – seeing them in action incredible. In the town hall building that’s exactly what was going on videotaping of the board shorts in action. Making commercials isn’t all that happens in the Town Hall there’s a passage to the recording studio. Complete with instruments and state of the art equipment. And does Hurley have equipment in another building they keep it old school with an actual dark room. They can also make surf boards. And in another studio where the walls are floor to ceiling graphics from past shirts, they can silk screen old school. They are also high tech with a wall of touch screens to check on all their social media sites and maybe my favorite high tech gadget the coffee table. Yes they have a coffee table whose face is a big screen television. It explains along with actual wet suits how thermo light technology works. Being a fashionista I appreciate clothing that’s less weight and keeps you warmer. Throughout the offices there are people working collaboratively on graphics and other things. It was not at all like the show The Office – I totally believe they like each other and enjoy their jobs. And they like to give back – they have a charity similar to Make a Wish. I really loved all the photos on the walls– made me feel they are proud of their history and that they have so many interests in addition to surfing such as skateboarding. They have their own indoor skate park including a wood pool. As if that’s not enough artists have come in and painted the walls. It was like being in a candy store and apparently they can go to other parks because they have a customized van from the Beastie Boys artist. It’s hard to decide if the skate park building or the last building on the tour was my favorite. It is Hurley so you know they had a building which was the company store. A company store is like an outlet store only better because it has the latest things and discount prices that are real and no pushing and shoving. In addition to Hurley they have Nike SB. Literally they have a wall of Nike SB shoes all colors all styles. I really had an excellent time and thank Dominique and Hurley for inviting me. By the way they found me through this blog and really want it to be successful. Yes they support girl power including girl skateboarding. I can’t tell you how much that inspires me to keep blogging. As for the picture I selected to go with this post. Raglan sleeves this year I want to see raglan sleeves especially with fun colors. And I support wearing a bikini top under said raglan– because they had the world’s best bikini top – it did come in colors but I’m going with the basic black as this summer’s must have. After a summer session of skateboarding, you are ready for the beach! BREAKING NEWS: Zombie Jonnie an accomplished shredder has confirmed the undead support girls skateboarding. The skating fashionista supports Zombie Jonnie and hopes everyone checks his account out. This is Jonnie’s best outfit – on point – super stylish – 2 thumbs up! And for you doubters – he landed the trick! 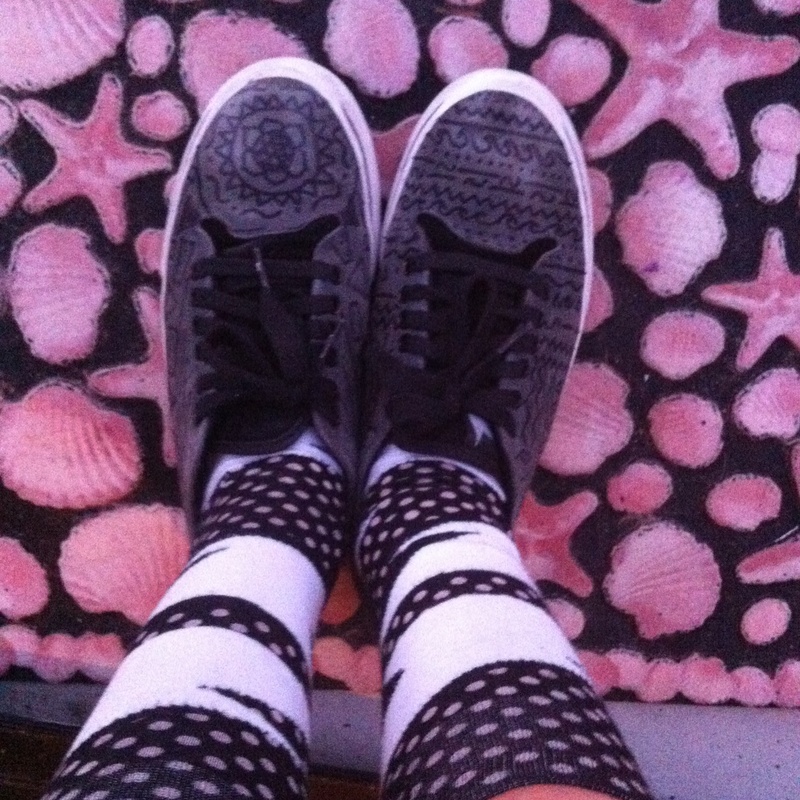 I live in my sneakers when skateboarding, so I like to keep them stylish. I recently customized my grey sneakers with black sharpie. 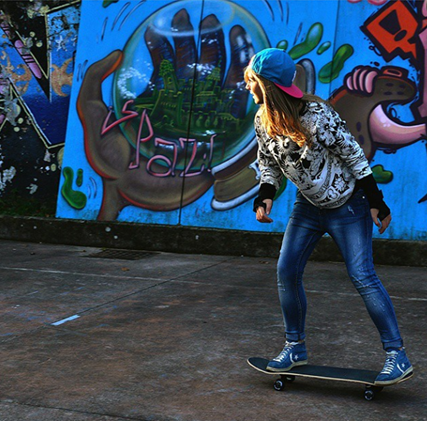 Happy feet – happy skater girl – hope others will share how they add their personal style to skateboarding. One of the things I truly love about skateboarding is each rider adds their own creativity. From the board you ride, the clothes you wear, to the type of skating you do – it’s all your choice!